NETWORK FINALS: ABC’s COLLEGE FOOTBALL game adjusted to 1.0 in final numbers, and FOX’s game adjusted to 0.4. CABLE HIGHLIGHTS: A typical fall cable Saturday, dominated by sports and late-night animation. ESPN had 3 games in the Top 10, led by the 1.31s for both Arkansas vs. Texas A&M and LSU vs. Auburn, and the network placed 5 more pieces of related programming toward the top of the chart. As for the Adult Swim line-up, DRAGON BALL Z lost a tick to 0.59/1.389M, ONE-PUNCH MAN gained 0.03 to 0.62, MOBILE SUIT GUNDAM rose 0.06 to 0.49, HUNTER X HUNTER jumped 0.09 to 0.44/973K, NARUTO was up 0.05 to 0.41/862K, ONE PIECE climbed 0.06 to 0.35/750K, and PARASYTE increased by 0.05 to 0.31/664K. Fox Sports 1’s UFC telecast gained 0.11 to 0.45. A pair of Nickelodeon shows just missed the Top 10, with the primetime HENRY DANGER up 0.06 to 0.37, and the afternoon POWER RANGERS at 0.36, with the even earlier morning MIRACULOUS just a bit lower at 0.34. On Spike, COPS was at 0.34, and JAIL: BIG TEXAS was at 0.24. 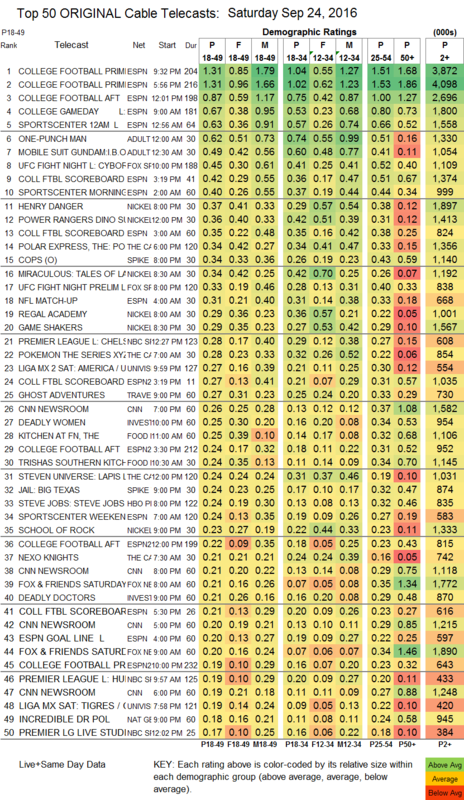 On Food Network, KITCHEN AT FN rose 0.03 to 0.25, and TRISHA’S SOUTHERN KITCHEN was up 0.03 to 0.24.